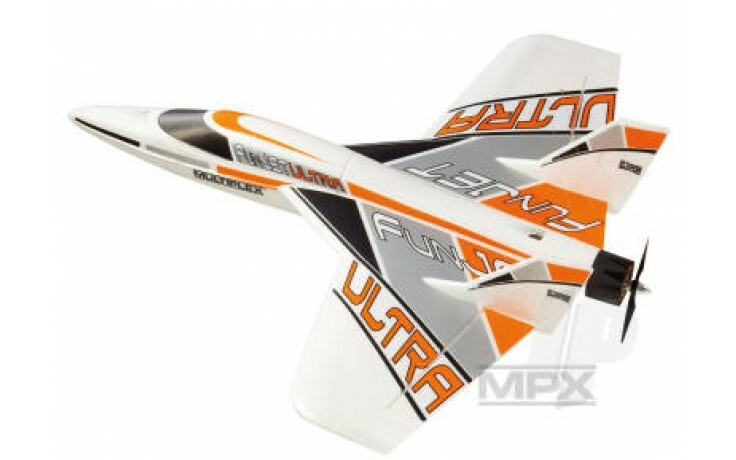 The normal FunJet from MULTIPLEX is already one of the fastest aeroplanes in its class, but many modellers are still not satisfied. So now weve created an even hotter EDF jet: the new FunJet ULTRA. If youre an adrenalin junkie, then this will really get your pulse racing. This model gives you the ultimate kick of speed, but still exhibits a surprising level of precision when guided through audacious aerobatic manoeuvres. The FunJet ULTRA needs considerable structural strength to survive such flying, and this it gains from higher-density foam and a CFRP spar. But the key to its performance is the new, more potent power system: straight out of the box the model accelerates to more than 200 km/hr and flies as true as an arrow - it really is ULTRA-fun!